View of Valle Crucis Abbey in North East Wales, near Llangollen. The abbey was founded in its remote location by an order of Cistercian monks in 1201. Valle Crucis translates as ‘Valley of the Cross’ and the Abbey takes its name from a historic monument, Eliseg’s pillar, that stands nearby. The Abbey was constructed according to traditional Cistercian design with separate spaces for the monks for prayer and contemplation and the lay brethren who performed agricultural work. There was a choir, a nave, separate smaller chapels, sacristy, chapter house, dormitories and a refectory. 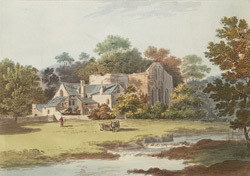 Valle Crucis Abbey was dissolved in 1537 and the main building was converted into a house and then later a farm.